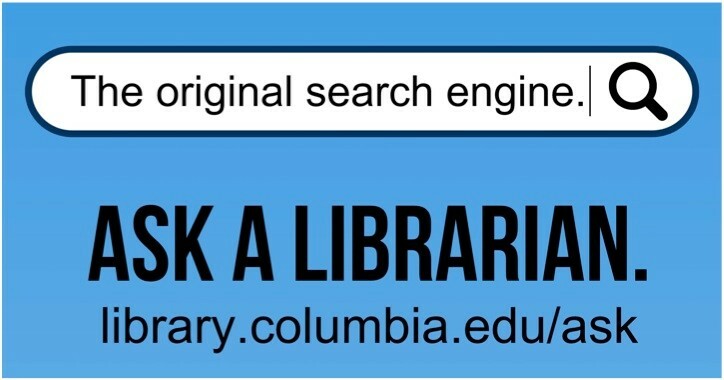 The Columbia University Libraries offer a wide range of research, instruction, and borrowing services to support all levels of academic research. Check the hours of our libraries, departments and services. Librarians are available to assist you with research support in person, via e-mail, phone, IM, or by appointment. If you need help, Ask a Librarian. Our Research Guides are curated lists of recommended resources (for specific academic disciplines and subjects) from expert librarians. The Libraries' website is a gateway to collections and services. CLIO is the libraries' primary search interface. It provides access to many kinds of resources, including books, databases, journals, and articles. Borrow Direct enables you to borrow books directly from other university libraries if the book you need is unavailable or is not owned by Columbia University. Interlibrary Loan is the service to use for items that are not available through Borrow Direct, such as journal articles.